This is a book my wife picked out for me and loaded on my Kindle, while I was reading the Robert E. Lee biography. Amazingly, the settings, battles, etc. are very much the same. 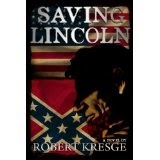 I enjoyed reading this fiction book - immediately following the Lee biography! In the closing days of the Civil War, Beth Wendland, a Union spy in Richmond, learns of a Confederate plot to send a wagon bomb to blow up the White House and kill President Lincoln and his top generals. Abandoned by her political masters, Beth must evade Rebel soldiers and the bomb's mastermind to deliver the information to Washington before the conspirators can launch their deadly attack. Assisted by the Federal officer who loves her, Beth risks more than her life to snuff out the burning fuse of the world's first vehicle bomb and prevent disaster on the eve of victory.